At least they're not pigeons. That is soo... CUTE!! X3 I heard roasted parrot is good, anyone wanna try? 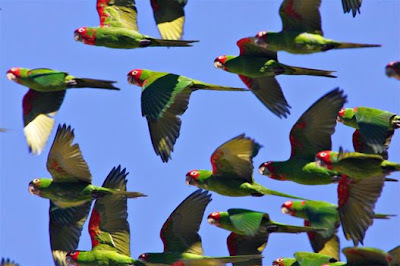 XD Lol, but that IS alot of parrots! Cool! the otherday i was taking a walk on the beach, and i hear this like GAWK, GAWK sound. At least a dozen people are surrounded around a tree and there's a GIANT blue parrot! thankfully, it belonged to someone...who was dressed like a pirate. Trust me, on a canadian beach, seeing a parrot is NOT regular. Oh yeah we had roasted parrot every thanksgiving! (none of us likes turkey)JK I would never eat a parrot! :) They are so adorable. Did you know that pigeons are in the same family as doves? Do you have something against pigeons? Much better than pigeons. Those things are even finding there way out here... But, the worst birds out here are seagulls (lakegulls?). They just stand around, sometimes raiding fields, and the don't even fly unless you nearly run them over. And even then, maybe three feet. Awww, that's so...loud! I love parrots.